This installment of the Star Log.EM-series clocks in at 7 pages, 1 page front cover, 1 page editorial, 2 1/3 pages of SRD, leaving us with 2 2/3 pages of content, so let’s take a look! After a brief introduction, we access the archives of the Xa-Osoro system (I like how these little files strive to include such flavorful little bits) and the pdf provides a brief, fluff-only run-down of famous duelists, to be more precise, a by now famous cadre of legends. After this brief intro, we move on to the archetype; envoys and operatives make probably the best duelists, courtesy of the focus on light and melee weapons- The duelist grants alternate class features at 2nd, 6th, 9th and 12th level. At 2nd level, we have uncanny defense, which halves the penalty to atk when fighting defensively (-2 instead of -4). At 6th level and every 6 levels thereafter, you also increase the AC bonus gained from fighting defensively by 1. Important: This bonus does not stack with others and does not apply while wearing heavy armor or powered armor. At 6th level, you gain parry: When you use a full action to execute a full attack with a melee weapon, you may forego one of your attacks. If you do, you may, at any time before your next turn attempt to parry an attack against you or an adjacent ally as a reaction. You may then roll an attack with the same bonuses (and penalties, I assume) of the foregone attack. If your attack roll exceeds that of the incoming attack, you parry it and it automatically misses. You may use this ability to parry melee and ranged attacks, as well as spells and other abilities that require attack rolls, but not effects that don’t require an attack roll. It is, at this point, no secret that I am not a big fan of the use of competing attack rolls in the more complex of d20-based games, but in this case, the lock-down that the action economy requires to activate this ability makes me somewhat okay with it….though personally, I would have employed SFRPGs different AC values to determine what can and cannot be parried, that remains a personal preference. 9th level builds on that with riposte: When you successfully parry, you may immediately make an attack against the foe that you parried. Note that, while you can parry ranged attacks, you cannot riposte them, since the ability works analogue to AoOs. 12th level yields crippling critical: When you critically hit a target with a melee weapon, you can substitute your choice of reduced speed, bleed damage and penalties to atk, AC or saves for the weapon’s regular critical hit effects. The pdf also sports 2 new feats: Perfect Defense requires Bodyguard or parry and 7th level. As a minor nitpick: The benefit-line is not bolded. The feat lets you use either parry or the Bodyguard feat 3times per round, +1/round for every 4 levels beyond 7th. It should be noted that this does require a full action. In Harm’s Way is similarly enhanced, should you have it. A minor complaint here: It is a bit weird to me that, RAW, uncanny defense’s benefits do not apply when using this feat’s defensive stance. The second feat would be Combat Reflexes, which allows you to execute more AoOs per round – however, each beyond the first requires that you spend resolve, which makes sense to me in the context of SFRPG. It should be noted that Combat Reflexes may not be combined with Perfect Defense. Now, remember the legendary duelists I mentioned? We learn more about the tradition they created and even get a code of conduct of sorts, adding some nice, flavorful bits to the end of the pdf. Editing and formatting are good, though not as impeccable as usual for Everyman Gaming. Layout adheres to the nice two-column full-color standard of the series and we get a nice full-color artwork. The pdf has no bookmarks, but needs none at this length. 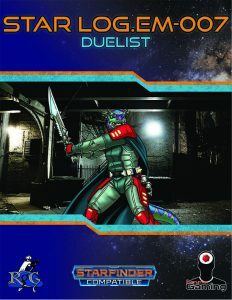 Alexander Augunas’ take on the legacy duelist is solid: It translates the core ideas to SFRPG, gets the interaction with the system done rather well…and left me, in spite of all that, with the slight feeling that the concept could have carried a bit more. If what you read above tickles your fancy, then the duelists will enrich your game; if not, then you will probably not be swayed by the pdf. As such, my final verdict will clock in at 3.5 stars, rounded up due to in dubio pro reo. You can get these nice duelists here on OBS!